﻿ Dr. Loriene Roy, Ph.D.
Dr. Roy’s writing, research, and service are centered on indigenous cultural heritage development. In addition, she advocates for the inclusion and study of formal and informal service learning opportunities for graduate students. She is founder and director of “If I Can Read, I Can Do Anything,” a national reading club for American Indian students. 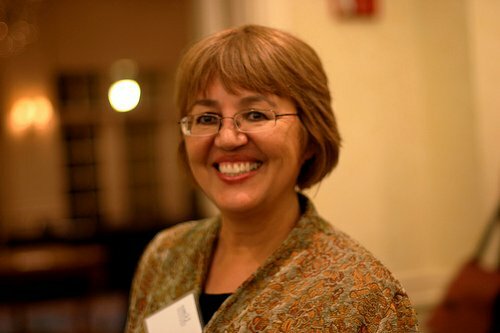 She was the 1997-1998 President of the American Indian Library Association (AILA) and the 2007-2008 President of the American Library Association (ALA). Her professional awards include the 2009 Leadership Award from the National Conference Tribal Archives, Libraries, and Museums; 2007 State of Texas Senate Proclamation No. 127; 2006 ALA Equality Award; 2007 Library Journal Mover & Shaker”; Outstanding 2002 Alumna from the University of Arizona’s School of Information Resources and Library Services; the 2001Joe and Bettie Branson Ward Excellence Award for Research, Teaching, or Demonstration Activities that Contribute to Changes of Positive Value to Society, two Texas Exes Teaching Awards; and two James W. Vick Texas Excellence Awards for Academic Advisors. She is Anishinabe, enrolled on the White Earth Reservation, a member of the Minnesota Chippewa Tribe. She is the 2012-2013 Chair of ALA's International Relations Round Table and the 2008-2013 Convener of the International Federation of Library Associations and Institution's (IFLA's) Special Interest Group on Indigenous Matters. She is a Trustee Emeritus of the LeRoy C. Merritt Humanitarian Fund. She teaches graduate courses in basic reference, library instruction and information literacy, reader’s advisory, indigenous librarianship, and information in social and cultural context. She has written widely and delivered over 500 formal presentations in venues around the world. Copyright (c) 2014 Lorieneroy.com. All rights reserved. Design by Free CSS Templates.